This weekend the 3rd edition of the Tengri Ultra Trail in Kazakhstan is on the Asia Trail Master agenda. A 70km relatively fast race through grasslands and rocky canyons of the UNESCO World Heritage Site of Tamgaly Tas, roughly 120 km from major city Almaty in the East of this big country. TUT is a genuine outdoor experience with camping along the Ili River included before the race. Increasingly more international runners with an adventurous spirit are travelling to Kazakhstan for the race. Belgium's Luc Hapers is one of those trail running globetrotters and has been since many years. This weekend he will be among the top favourites for the victory in the Tengri Ultra Trail, as his pace is still quick, too. Formerly living in Bali, Indonesia, Hapers is also familiar with trail running in Asia and that makes for an interesting talk. Q: Luc Haepers, born in Belgium but quite familiar with Asia and in particular Indonesia. How's that? LH: My first introduction to Asia was Bali. I was 18 back then. I fell in love with Bali immediately and I went back nearly every year since. Year after year I explored more and more countries in Asia. I started running when I was 30. That's when my older brother convinced me to join him in a 5 km race. Q: Did you have any running or sports idols as a youngster? I practice sports a lot, but don't really like to watch it. And if I do I am neutral so I never have to be disappointed after a game or race. Q: You're known as an ultra runner, doing several races a year. How do you recover between races? I guess I can say that I usually recover very well after an ultrarace. In some cases I only needed a day or 2. But when my body needs more time to recover I listen to my body. I'm asking a lot of my body but sometimes you have to give something back. It works both ways...to me it's just like a relationship...give and take. I treat my body well and I get strength and performance in return. Q: Do you keep a training and nutrition plan? I do not stick to any nutrition or training programme. I don't want to get a sense of pressure. I eat healthy all the time...it has become a habit...a lifestyle to me. I strongly believe that it helps me to perform better. I'm always experimenting with my nutrition intake and way of training. Nobody knows your body better than yourself. Q: What's the toughest race you have done so far? That must have been either 'la diagonale des fous' in Reunion last year or 'la echappe belle' in France. Q: What's your ambition still in trail running after all these years? My plan was to compete in the Asia Trail Master series but I'm not sure I will be able to join enough races to do that. I would love to do a multiple stage race like Transpyrenean or Atacama crossing. A few more podiums would also be lovely. Q: How do you select races on your programme? I always combine my races with a holiday. I try to pick at least 1 country I haven't been to every year. Q: How do you see your chances of reaching the podium in Kazakhstan this weekend? Looking at last year's results I would be able to win...but every year is different. Podium should be feasible...if everything goes well!! Q: Having done plenty of races in Indonesia and Asia in general, would you say there is a difference in the organisation of Asian and European trail events? I think that Europe has some benefits in terms of sponsors, expertise, status of some races...etc but me personally I prefer the smaller races. Q: Do you have a recommendation perhaps for organisers in Indonesia based on your experience? In general, trailrunning in Asia is still in its infancy compared to Europe. Communication can be an issue in some cases and lack of information before as well as during the race. Oh...one more important thing...keep the trails free from rubbish. Disqualify the ones who litter! Q: How should people in Asia imagine racing in Belgium? You would think that trailrunning in a rather flat country as Belgium is nearly non-existent...but it's not like that at all. In fact we do have some hard races in here. A self-navigating 250km race with around 9000m of altitude gain for example. The biggest difference is probably the fact that we don't have this long, never ending ascents and descents. Q: Would you like to see trail running become an olympic sport and why or why not? I'm not waiting for it to become an olympic sport. I prefer to keep it low key. Q: Do you feel trail running merits more institutional oversight, e.g. in the field of safety? I would say it's the job of the organizer to determine the safety of the course. He also has to make it clear on the website and during the briefing. Q: What do you think of the Asia Trail Master championship series? The Asia Trail Master series is still new to me. But I definitely like the concept. Q: Do you like running with music? if yes, what's your favourite tune? As I mostly run in nature I hardly listen to music while running because I don't want to exclude myself from nature. but if I had to choose I would go for Sigur ros' music because their music is one with nature! 'Ik loop' from Belgian band Halve Neuro is one of my favorite roadrunning songs. Last weekend at UT Unseen Koh Chang, aka UTKC, we had the pleasure of welcoming one of Japan's better known trail runners on the international circuit. Wataru Iino made his debut in the Thailand SuperTrail of the 2017 Asia Trail Master series and he did it in great fashion. Not only because of his charming smile and seemingly eternal good mood, but also because of his grabbing-the-bull-by-the-horn race tactics. After checking out his main rivals for the race in the early sections, pre-race favourite Wataru Iino just went for it and attacked already with over 70k still to go. A winner and podium placer of several big ultras on various continents, it looked like the UTKC 100k race was his. However, the extreme heat on Koh Chang last weekend, with temperatures rising well above 40 degrees, caused its toll on the Tokyo resident. Wataru Iino began to suffer from dehydration and had to accept the return of Malaysia's Steven Oong, who by nature is of course more adapted to those climatic conditions. They crossed the finish line together, helped by the fact that Oong has no championship ambitions due to his unpredictable international work schedule. Wataru Iino showed his sportsmanship and gratitude giving hommage to Oong, and looks set to become an exciting contender for this year's Asia Trail Master championship title. Time to get to know the man a bit more. WI: I was born in Tokyo, Japan, and grew up there as well. I'm an engineer in a car company. What made you become an ultrarunner? I just developed into it, also by focusing on my diet. How did you get involved with running at all? I used to go to work by train and one day I changed by running the route for 18 km one way. What has been your biggest achievement as a runner yourself? I once ran for 55 hours without sleeping in a trail race. What are you favourite sports other than long distance running? Running, and. especially marathon, is very popular in Japan. What is your explanation for this? There are 4 distinct climate seasons in Japan. That means running never gets boring as the landscape keeps changing. Is the Tokyo Marathon the biggest running event in the country? I don't think so. Plenty of other marathon/trail races are huge as well inside the country. How do people feel about the upcoming Olympic Games in 2020? It depends. Some people are looking forward to seeing world famous athletes, but some people also worry about incidents and other potential disturbances. Haruki Murakami wrote a book entitled "what I talk about when I talk about running". So, what are you talking about? There is no other sports than marathon in which “effort” counts more than “talent”. If we may say so, Japan is still a little bit of a closed society and many mass sports events only cater for domestic participation. Is this deliberate, or would many organisers actually like more international exposure? I guess Japanese organisers welcome foreigners anytime, but they cannot fully support them due to language and cultural issues. Mr Hiroaki Matsunage is opening his trail events, such as the Echigo Country Trail and Kushigata Wind Trail, to Asia and the world. How important would you argue his work is, and will we see you running in one of those two races, which are also part of the Asia Trail Master series? from Tokyo as they are really in the Japanese countryside. What should a good trail event look like in your view? Trail races depend heavily on volunteers. Therefore organisers should always communicate extensively with local people. The races that have all volunteers and local crowd cheering for runners are the best. It is all about the atmosphere. How do you see the future development of trail running in Japan? Recently, there have been some conflicts with local authorities in the Kansai region. Again, an event cannot be successful without an agreement with local people. We need strong cooperation from them. You are one of the top favourites for the Thailand SuperTrail UTKC, will we see you challenging for the Asia Trail Master championship this year (the interview took place a few days before UTKC, kvdv)? Maybe, currently there is no fixed plan yet. It will depend on how UTKC goes, I guess. I tend to listen the music of "Sister's act". Ultra Trail Nepal is a much-anticipated new entry in the Asia Trail Master championship series this year. The spring time version of this event takes place on 25 April - a Tuesday - and that is on purpose. On that day it will be precisely two years ago since Batase and the wider Kathmandu region was struck by a shattering earthquake that demolished villages and brought immense suffering to lots of local communities, many of which were cut-off from the rest of the world for days. UT Nepal has been set up to help get people back on their feet, and aid with the reconstruction and relief efforts. Som Tamang has been the driving force behind the UT Nepal organisation, which also had a 'winter version' last January. While now living in Australia, Som was born in Batase Village and was personally affected by the earthquake. His remarkable story is one of devastation and heartache, but also of inspiration and hope. Two things he very much conveys to his native community today, and UT Nepal is just one element of that. As the event date is coming closer, we recently were talking trail running with Som Tamang. I own a Fair Trade store in Cairns, Australia. I import handmade items from Nepal, and where possible I sell items made by people from my village. Along with my wife, I also run a company called "Take on Nepal", we take groups of volunteers to Nepal where they volunteer in remote village schools. I also take groups on trekking expeditions to some of the most popular parts of Nepal. What made you move to Australia? I moved to Australia in search of an education. I was able to attend school up until the age of 10 in Nepal and then I was forced to leave my village. i went to Kathmandu where I became a child slave for a wealthy family. I then became a street seller and eventually a porter and a trekking guide. I received sponsorship to come to Australia where I began my studies and in 2014 I graduated from University with a Bachelor of Creative Industries. I was the first person from my village to achieve. How would you compare Nepal with Australia when you think of its citizens? Australia gave me opportunities that I never imagined were possible for a poor boy from Nepal. The people are amazing and have shown their kindness and compassion through supporting my humanitarian projects. Many Australians come to visit the people of my village and it shows that there are more similarities than differences between both cultures, we are all human and we try to be good people. How did you get involved with running? The Earthquake that destroyed Nepal in 2014 had a huge personal impact on me. My 24 year brother was killed as were many other people from my district. Every home in my village was destroyed. I came into contact with Samir Tamang, Samir is an accomplished trailrunner from Nepal. I started helping his village which was also destroyed by the Earthquake and through spending so much time with him, I started to develop a strong interest in trail running. I started running long distances and realised that it was helping to relieve the emotional pain and stress that I felt from the damage caused by the Earthquake. Once I hit the trails, my stress started to leave my body and this felt great. I then introduced trail running to the other villagers, who also recognised the benefits of running. My biggest achievement has been to introduce the benefits of trail running to others and to then begin organising races in Nepal. I am not out to be a champion, I am doing it for the benefits and the connection to nature. Another achievement has been the hugely successful trail running events that I have organised in Nepal; many local and international trail runners have loved running in the mountains in my beautiful country. Samir Tamang is undoubtedly Nepal's best trail runner. He inspires me and motivates me, Samir is also a really great person, with a big heart. Lizzy Hawker is another athlete that I look up to, her achievements are unmatched; she shows true grit and determination in her ability to be the worlds greatest endurance runner. Lizzy is an inspiration to the village girls of Nepal who Lizzy supports and trains. Do you often take part in trail races yourself? Yes! I participate in races in Cairns, Queensland, Australia. I do this for enjoyment and participate whenever I can. As a race organiser, i am often too caught up with networking at other events to be able to participate. In a nutshell, how would you describe UT Nepal? Ultra Trail Nepal, in my opinion, is a race that will appeal to anyone who is happy to challenge themselves and to humbled by the highest peaks in the world. UTN is unique, our runners pass through traditional villages and get a true understanding of the culture and the people of Nepal. UTN provides our local, talented runners with the opportunity to run with international runners, this is a rare opportunity in Nepal. UTN also aims to empower young women to hit the trails through providing running gear, support and entry into the race. Is it a race that basically any runner can do, or do you need to have sufficient trail experience? This race is perfect for everyone! We encourage people of all ages and experience to participate. the trail is well marked with plenty of support along the way to ensure a successful outcome for everyone. Trail experience will of course allow the runner an easier and more enjoyable experience, we do recommend that you train well before participating. When will you be a happy organiser? I will be happy when we can support our Nepali runners to race internationally, when the event is as popular as the big events in Europe, US and Australia, and when we have over 3000 runners running through our mountain villages who are gaining an understanding of the issues faced by the average person in Nepal. I also want to be able to fund the rebuilding of villages along the trails which has been affected badly by the Earthquake. What would you advise for international runners who come to join UT Nepal in April? Do not have any expectations, come with an open mind and heart; this will ensure a positive experience for you. The trails are challenging but the rewards are greater. Two years after the big earthquake, how has reconstruction been going? The reconstruction is slow, most people are still living in corrugated iron shelters. Most schools have not yet been rebuilt. The country has a very long way to go to rebuild. I am the founder of the not for profit organistion "Friends of Himalayan Children Inc." and through our fundraising efforts, we have been able to assist in caring for 40 children who were left disadvantaged after the Earthquake. The charity also pays the wages of school teachers. In the wake of the Earthquake, we provided remote villages with a huge amount of emergency relief. How has the quake affected the spirit of the people? The Earthquake has caused a huge amount of emotional turmoil for the people affected. My own Mother fell into a deep sadness and is only recently feeling better to cope. The people of Nepal are by nature resilient, life was tough before the Earthquake and now they have had maintain their strength to get through this difficult time. Everyone who visits Nepal are always taken by the kindness of the people of Nepal, and the Earthquake hasn't changed that. How important is running for the Nepalese? Is it a big sport in media? Trail running is not a big sport in the media, the people of Nepal are naturally built for trail running but due to a lack of information and exposure to the sport, they are unaware of it. Ultra Trail Nepal is working hard at a governmental level, for trail running to be recognised as a sport in Nepal. What is the influence Mira Rai has had, and are there any potential successors? Mira Rai is an amazing role model to many young girls in Nepal. Mira visited Batase as a guest at our first UTN event, she inspired our young people to get involved. There are many potential successors and we are working hard to provide them with the opportunities to gain much needed exposure to trail running events around the world. Can Nepalese runners in trail running become the equivalent of Kenyans and Ethiopeans on the track and road? What is needed to arrive at that situation? Absolutely! Due to our genetic make up, we are naturally built for running amongst the mountains! I strongly believe that Nepalese runners can dominate the trail running scene. What is needed is the correct training support which includes access to required nutrition, sports equipment and opportunities to challenge themselves in international events. Most people in Nepal are living in poverty, this prevents potential champions from being able to fulfill their potential and through UT Nepal, we want to support our runners to achieve their goals. How do you see the future development of trail running in Nepal? I recently met with the Minister of Sport in Nepal, he attended our last UT Nepal event; this is to provide him with an understanding of the sport in the hope of having a trail running association in Nepal in the near future. I am working hard on this one! Running, and trail running, has seen a boom in popularity. Can the same be said about Australia? Trail running is becoming very popular in Australia. UTA is a huge event which attracts runners from all over the world. This event inspired me to start events in Nepal. It is nice to see more people getting off the roads and into natural environments! Many athletics federations in Asia do not recognise trail running as a genuine discipline.How is this in Australia? I believe that Australia still have a long way to go in comparison to Europe. Australia does have a trail running association and we have many talented ultra runners who are not recognised by the media for their amazing achievements. I think within 10 years this will change! What do you think of the Asia Trail Master series? The Asia Trail Master series is fantastic, the concept of bringing all of the races together to culminate into a championship is amazing. We feel very excited and proud to be involved with the Asia Trail Master Series. The organiser, Kris Van Der Velde is a great organiser and also a wonderful humanitarian, he provides opportunities to people who are often in a position not to participate in such events. Would you believe that I don't listen to music when I run?!! I love tuning into my natural environment when I am running! When I'm not running, I love listening to the music of U2, my Irish wife influenced me there! Upcoming weekend the 2017 Asia Trail Master Championship series begins in Indonesia with the Tahura Trail. Taking place in Bandung, West Java, and one of the most popular races in the country, the fifth edition will see loads of strong runners at the starting line this Sunday morning. Both defending Asia Trail Master champions Manolito Divina and Tahira Najmunisaa will begin their new campaign, and will face strong local opposition in the 42 km race. Not in the least by Abdoullah Mitiche. Born in Algeria, Mitiche won the race last year as a triathlete in love with Tahura Trail. Now residing in Jakarta, Mitiche is determined to give the established trail running stars a run for their money again this weekend, and does not even exclude going after the Asia Trail Master Championship title himself one day. Currently, though, Mitiche's season planning sees him focusing first and foremost in long distance triathlon and IronMan. We were talking trail running with Abdoullah Mitiche, and disovered a genuine athlete with a very interesting story. ATM: Where were you born and did you grow up ? AM: Algiers, a hilly city on the Mediterranean sea and the capital of Algeria, a country with a tradition of middle-distance running (800m to 3000m) and a home specialty in the 1500m: 4 Golds at this track race in the last 6 Olympics have been won by Algerian runners (2 men and 2 women). ATM: Was running something you have always done, or is it a recent hobby? I’ve always loved Running, but haven’t regularly practiced it until 6 years ago. Growing up, I loved the instant feeling of freedom and speed it provided and the rewarding sense of achievement at the top of a hill. Back in high school, I joined a sprint team for almost one season, which was completely different from the running I do now: Training for 200m and 400m races, we didn’t do long runs (we didn’t have to), but we learned the ABC’s of running drills, clearing hurdles, and most importantly: Sucking up pain outside one’s comfort zone! And after trying many other activities recreationally in the following years (basketball, parkour, hiking, tennis and even ultimate Frisbee), it’s not until end of 2010 (at age 28) that I became a runner, thanks to an Australian runner, Stephanie, then Minister Counsellor at the Australian High Commission in Port Moresby, who persuaded me I could run further than I thought I could. ATM: What do you do for a living? I’m a Risk Management consultant in the telecom industry; my office job takes most -if not all- my daytime but has also enriched my experience and taken me to uncommon yet wonderful places: Haiti, Jamaica, Papua New Guinea and for the last 4 years: Indonesia. ATM: You are mainly a triathlete. Have you completed an IronMan already? I’ve been a triathlete for the past 4 years; and after a couple of experimental and introductory short course races (Novice, Sprint, and then Olympic distance), I soon realized I’m more suited to long course events and enjoy them much more; I’ve done 10 since: 8 Half-Ironman distance (70.3) and 2 Full Ironman, all of them in South East Asia. ATM: What is your ambition as a triathlete? 4 years ago, I would’ve answered: “Getting faster” but then Joe Friel, my Triathlon guru, taught me better: “Goals should be event outcomes, not vague statements about your dreams of success. They should be well-defined, measurable … and just out of reach” to quote him. So my mid-term triathlon goals –Brace yourself for some geekiness- are: to improve my swimming to sustain a 1:45/100m pace for 1h, increase my cycling FTP (Functional Threshold Power) to 305 watts, and run a 3h15 marathon off the bike in an Ironman race. ATM: Are you member of a sports club? No, but I’m a proud member of the Indonesian sport community that welcomed me to its family and treated me as one of its own. “Indorunners” is the running community I joined as soon as I started calling Jakarta home; Triathlon Buddies is my triathlon community; When it comes to Trail, I was lucky enough to have met Om Wailan, a fellow-member of both those communities, who knows the local trails like his pocket and likes exploring new ones. He showed me around my first trail runs in Indonesia. ATM: Do you have any sports idols, athletes you look up to? My early idol would be my father, former national record holder of Triple jump and a true amateur who combined between his athletic passion, medical studies and surgery profession. Other sport idols are Kilian Jornet and Javier Gomez. ATM: When did you discover your talent as a runner? It must have been my marathon debut: The Sahara Marathon, in February 2012; a 100% sand trail race in the Algerian desert, that I didn’t train or taper for specifically as I was training for my first 100km Ultra 2 months later; Ultra training means back-to-back long runs and I wouldn’t let a “C race” compromise my training for my “A race”, so I went for a 3h run the day before; to my surprise, on the next day: I clocked 3h24 in my first 42k and ranked 9th overall in an international field; It did hurt but all I remember now is how much I loved it, I thought: "I might be good at this endurance stuff! I should do more of it!" ATM: What does your training plan look like? How does trail running fit in? I’m a big advocate of scientific and structured training, and think it’s the most efficient, fastest and safest way to optimize fitness and performance. I divide (or periodize) my season into periods: Base, Build and Peak, then divide periods into blocks, then divide blocks into 3 to 4 weeks, each block would culminate with either a recovery week where volume backs off or a race; races are ordered by priority from A to C. My weekly training volume ranges between 13 and 19 hours depending on the period and the block. I love trail! I feel close to nature there, “The meditation of the trail” as Jack Kerouac beautifully puts it; I would do most my running on trails if I could, but I live in Jakarta, one of the most urban metropolis in the world, and I could only run trail occasionally on weekends or holidays, in either Sentul (around 50km south of Jakarta) or Bandung (180km southeast). For 2 years in a row, I’ve been dedicating my end of the year holiday to trail running as an Off-season activity; in fact, I’m just back from a multi-day ultra-trail in the Sahara where my friends and I covered around 120km over 4 days in the breathtaking Algerian desert; during which we were at least 100km away from the nearest electricity socket, water tap, mobile tower or civilization sign we otherwise take for granted; my face got sunburned, my hands and feet froze in -3° at night, but I got my fix of trail endorphins (and sand). ATM: Where do you do cycling training? As a triathlete, cycling represents at least 55% of my training volume; I used to be do all of it outdoors (the “old school” way), at crazy hours as early as 4am to avoid Jakarta’s epic traffic and reduce my exposure to pollution. I now do around half of it indoors on my Kickr smart trainer that adjusts resistance according to the specific wattage I want to achieve in my effort and recovery intervals; I even embraced a virtual reality technology recently called Zwift that allows cyclists to ride together on virtual islands with climbs and descents and even races. I do most my outdoor cycling with my KGB (Kelapa Gading Bikers) friends, on the hazy roads and flyovers of Jakarta city center on weekdays and in Sentul hills on weekends. ATM: Do you pay attention to your food before a race? Are there any special products you take in preparation for your race? I take nutrition pretty seriously, we call it Triathlon's 4th discipline; when one sets off on an endurance event that lasts the entire morning (or the entire day), our food intake before and during the event has direct impact on our performance. I never skip my race morning breakfast, I usually have it early (2h before the start), and keep it simple, high carb, low-fat, low-fiber. No pre-race special products really, but my usual race morning breakfast is: a banana (or couple of dates), milk (chocolate or plain), toast with honey, black coffee. I’d have lost some fluids by the time I finish my warm-up and line up at the start-line, so I either down a gel with some water or sip from a small bottle of electrolytes drink while waiting for the gun to go off. ATM: What is your best time on the road marathon? With my focus on multi-sport events, it's been over 2 years since I last ran a stand-alone road marathon: Jakarta Marathon 2014 is the last one I ran and remains my PB in 3h06, way off my Sub-3 target! My "lame excuse” is that I raced Ironman Malaysia 4 weeks before the marathon and hadn't recovered from it, but I want to have a crack at the 26.2 either late 2017 or early 2018. As a Jakartan runner, one of my targets is to run Sub-3 Jakarta and Bali Marathons; heat and humidity are always going to be hindering factors in our tropical climate, but we just have to deal with it. ATM: Do you often take part in trail races, or was Tahura Trail 2016 rather an exceptional event for you? I race trail whenever I can fit the event into my training and racing calendar. I must admit things used to be more spontaneous and much simpler when running was my only discipline, but the questions I now have to answer before putting any stand-alone race on my calendar (not only running but also cycling races) are: Does the date fit in my blocks? How far is it from my “A race”? Does its distance fit into the program? Will I be able to do a long ride and swim the day before/after? ...etc. But with the right planning, I could fit around 8 running races a year, probably half of which are Trail. ATM: What do you like about Tahura Trail? It's only 2-3h drive from Jakarta. It’s a full-fleshed Trail Race that features breathtaking 45% climbs, mud, rocks, water crossings, bushy single tracks, treacherous descents, slippery cobble-stone, alleys through kampungs, cabbage and eggplant farms, and an epic elevation gain; a real all-terrain trail. It grew to become one of the best and most popular trail events in Indonesia, thanks to its organizers commitment to improve it every year: smooth registration, a punctual start, a very well-marked trail, sufficient water stations and marshals on course, accurate timing system, quick results. I've seen all these aspects improve year after year. I usually meet my big trail running family in this event (even many triathlete friends), and catch up with them in a pleasant festive ambience. The last reason is not objective and rather bias: I stood on Tahura's podium a couple of times but it took me 4 attempts, 4 years in a row to finally win it; it's my story of stubbornness. ATM: What is your favourite type of trail race? Long course, diverse terrain and hilly profile. ATM: What is your dream as a trail runner? Reading the ultra-trail literature out there played a big role in getting me into running, so it’s always been a dream to run an iconic race from that literature like Western States 100 one day. In Indonesia, Mount Rinjani Ultra (MRU) in the beautiful island of Lombok is a trail race I’ve always wanted to do, but could never make it as it usually conflicts with a key triathlon race in Bintan island I always commit to; I hope I can run it one day and have a go at breaking its course record. ATM: Running, and trail running, has seen a boom in popularity also in Indonesia recently. How did you experience this? I’ve seen it grow exponentially: Back in 2012, runners down the street used to be a rare sight, running events could be counted on fingers and I used to see much more bikers than joggers on Jakarta’s weekly Car Free Day (CFD). Runners grew in numbers in the past 4 years; there are running events almost every weekend now (sometimes more than 2 on the same day), some of which draw thousands of participants, most running events are Road, but increasingly Trail too; many Jakartan cyclists avoid Car Free Day on Sunday, “It’s been taken over by runners” they mutter. The running boom in the country is in my opinion only the tip of the iceberg, research studies show obesity has been rising rapidly in Indonesia and is becoming a major threat to public health; While urgent policy work is required to address the problem, I think we runners should play a leading role and be part of the solution: Raising health-consciousness, advocating running-friendly cities, demanding a minimum of green space “square meters per capita” in urban areas, sidewalks, trails …etc. ATM: How do you see the future development of trail running? I believe trail running will continue to grow in popularity in the region and the world, not only because health awareness and runners’ numbers will continue to increase, but also because more road runners continue to look for less urban and more beautiful sceneries, cleaner air quality, and just runs that are more pleasant and more fun; all that can generally be found when we return to nature and run trail; with this comes a responsibility to protect environment, keep our trails clean and keep them green, “Leave nothing but footprints”. ATM: Many athletics federations in Asia do not recognise trail running as a genuine discipline. Is this holding the sport back? Definitely, would any cycling federation stop recognizing MTB as a cycling discipline?! It’s unthinkable; MTB is a well-established and fully recognized part of cycling. The same terrain differentiation applies to Trail running; I really hope its growing popularity will convince Athletics Federations in the region to regard it more progressively, recognize it, support it and nurture its young talent; Trail is not Track, nor Road, not even Cross-country, but it’s still Running. ATM: Should trail running become recognised as an olympic sport? Yes; Going back to Road vs Off-road cycling comparison, Mountain Biking (MTB) was born in the 70’s, then became an Olympic discipline in 1996; BMX followed and made its Olympic debut in 2008. When it comes to Trail Running, even though the sport is relatively new, the activity itself is not only older than its track and road siblings, but as ancient as humans themselves! I think IAAF recognition of Trail Running as an official running discipline in 2015 is a step in the right direction and would eventually lead to the sport becoming Olympic. ATM: How is triathlon organised in Indonesia? Are there many events? Sungailiat Triathlon (Bangka) [Distances: Sprint, Olympic, Long course]: born as a Duathlon in 2012, it never stopped improving, adding new distances and drawing more participants each year. Triathlon Buddies Mini-Tri (Jakarta) [Distances: Novice, Kids]: is my community’s anniversary, it strives to introduce Triathlon to newbies (I was one of those newbies when I joined it 4 years ago). Ironman 70.3 Bintan [Distance: 70.3, Iron-kids]: The first Ironman race in Indonesia in 2015, it’s making endurance Triathlon more popular. ATM: What do you think about the Asia Trail Master series? Could you see yourself tring to win the ATM championship one year? I think it’s a brilliant idea to bring the Asian Trail Running scene together and connect quality races in different Asian countries into one series system that rewards runners of all capabilities, it certainly adds to the sense of achievement we get from practicing the sport we love; which makes me think: there should be something similar in triathlon on national or regional level! I love endurance sport and intend to do it as long as my heart beats and legs move; so I do have in mind, at some point, to dedicate a season or 2 to single-sport events; winning ATM championship would be an exciting goal to aim for in the running year(s)! ATM: Will you compete again in Tahura Trail next week? Of course! Not only to try to defend my title, but to stay true to my tradition since Tahura’s first edition 4 years ago. ATM: Finally, what is your favourite piece of running music? Majell Backhausen is one of Australia's finest elite trail runners and since very recently the official Coach of our Asia Trail Master series. Currently residing in Europe for the summer trail season over there, Majell has taken time out of his busy schedule for what turned out to be an in-depth, honest and overall thought-provoking conversation covering most aspects of trail running as we know the sport today. A true fan of Asian trails, Backhausen will be a regular visitor on the ATMs circuit in months to come, and all runners are kindly invited to contact him for any kind of advice on race preparation, nutrition, recovery and so on. But first, sit back and relax, as Majell Backhausen is Talking Trail Running! First, please tell us a bit more about yourself, where you come from exactly and how did you develop into a long distance runner. MB: It is probably best described in the two short films linked below. But, in short text, I was brought up in a famous street in the town of Red Hill, Victoria, Australia. It's known for its Australian Rules Football and Cricket stars, two sports which filled most of our days as young kids. I was able to grow up with a great amount of competition and fun. However I did become a teenager and thought the best way around things, was to be an idiot, smoke and drink. How stupid, I was. Running didn’t happen until late 2011 when I was 23. I used it to replace football, while living in London and since then it has become a part of my life, for the better. Your family name suggests you have German ancestry. Correct? That's right. Dutch and German to be exact. I can eat a large amount of sauerkraut, to prove it. What is so great about trail running for you? The unforeseen adventures that can happen. No matter how good or ‘bad’ they are, they always come with a story and an experience, which can more often then not be laughed about. The people who you meet are often just as good too! Also, the food that can be eaten after a good session. Food is important! Is running part of your family history? Judging by the blank stares and shaking heads i get from my family, I would say, No! Holland is the flattest country in the world, but I love mountains, so that doesn’t really add up either. What is your personal best on the road marathon? I would like to better this time in the future, but currently it is 2:37. You are quite tall for an elite trail runner. Is there any kind of terrain where you feel disadvantaged? I will take this as a compliment, thank you. I am just over 6 ft 1” (1m85). I think I can develop a lot more strength in certain areas, due to my physiological make up. I am not disadvantaged though. If I wanted to be better in a Vertical Kilometre, it is up to me to train and work hard in that area, to succeed. I would not give up on a certain discipline, just because of my size. What is your favourite type of trail terrain? Something that is a little bit uncomfortable, whether that is a lot of elevation gain, technicality or length. It really is ‘fun’ to stand on the start line, a little scared, of what is to come. Which race has so far made the biggest impression on you? It is an event called UTTJ (Un Tour en Terre du Jura) in France. It is an event that showcases everything that is important in Trail Running. The people, their passion, hospitality and commitment is something I have not seen in any other event. It is tough, scenic and you can eat very well in Jura. How has the trail running community developed in Australia over the past few years? There have been rumours of draconian new regulations lately, which hamper further development. Just like it has globally, trail running in Australia has grown substantially in the past few years. Like most ‘young’ ventures and new to the market ideas, the future in Australian Trail Running is exciting and a little unknown. We always have draconian regulations in Australia, so it's not too surprising to us. Have a look at a mandatory kit list for GOW100km or UTA100… you will see what I mean. If runners travel to Australia once in a lifetime, what is the race you would recommend to them? This is a tough question to answer! I would recommend they book a journey that last approximately 12 months, which will allow time to acclimatise, then race, recover and race, again! Two events I would equally recommend would be: Great Ocean Walk 100km (GOW100) and Ultra-Trail Australia 100km (UTA100).They both showcase great Australian scenery but are very different in there organisation and execution. They are must do events in Australia. You are sponsored by Salomon and Suunto, two of the biggest brands in trail running, but all in all most events lack sponsorship, despite the so-called boom. In your view, what are the main hurdles for brands and companies to embrace trail running? It really comes down to the chosen avenue and approach towards marketing. There are so many options available at the moment for success in marketing. Sponsoring events, has been a proven way, to successfully market a brand to a target audience. Now, I see a lot of other marketing techniques and projects being employed by companies such as Salomon and Suunto. It comes down to exposure and the more exposure a marketing campaign will generate, the greater benefit a brand with gain. The more the sport grows, the more opportunity there will be for brands and companies, to become more involved and embracing. Salomon has been a pioneer in Asia when it comes to trail running. Many runners even believe it is the only brand out there with trail running gear. As an elite athlete for the brand, how can Salomon keep this position as market leader, now plenty of other brands are moving in? Salomon keeps the original values of the company, behind its forward progression. Which will allow it to always be a leading brand in trail running and mountain sports. Salomon was born in the French Alps and is driven by progression, product development, quality and craftsmanship. The equipment and gear produced by Salomon, allows people to move freely and explore the challenges in the outdoors. Simply, listening to its core customers and athletes, Salomon will continually develop products that will benefit people involved it the sport and they will lead the market. This year you have again been selected by your country's national association to take part in the world championship of trail running, which takes place in Portugal this year. Not a lot of people are actually aware of the existence of a world championship race, would you agree? Yes, just like the sport as a whole, the World Championships for Ultra Distance Trail Running, is still relatively unknown. But has an equally bright and promising future. In 2015 the IAU, put together a really great event and it was executed very well. A certain improvement on the 2013 edition. I believe the 2016 World Championships will again be better then previous years and just like the sport, it will draw more attention and interest! I would advise everyone to view the selection criteria for their own country and see if they will be putting a team forward to compete. Then work hard to be selected and become a part of the experience! Is UTMB simply too dominant? In other words, should UTMB simply be recognised as the world championship of trail running? UTMB is a fantastic event! The course, the atmosphere and the history, all come together to make a really amazing event to experience. It is dominant, but I think this is just one of many great events. I don’t think it is necessary to make it a World Championships. There are other events, which are capable of hosting a World Championship. In the next few years, more events will be as well known as UTMB. The sport is growing and the events are becoming better and better, it is an exciting time! Would you like trail running to become an olympic sport? Yes, it would be amazing to see. But it should still hold the true values of the sport. It could allow the sport to grow and be accessible to more people, therefore allowing the benefits to be experienced by more people too. Are you afraid of the influx of banned performance enhancing drugs in trail running? Another professional runner we recently spoke with refuses to do races in certain countries, because he is convinced the local elite is using drugs to score as much prizemoney as possible. I am not afraid of it, no. It is a shame that this happens. I much rather focus on my own abilities and improvements. Along with helping other athletes achieve their goals. Being fast in one thing, being respected for being a nice person and having a good laugh is much more important to me. Given drug testing is prohibitively expensive for the big majority of races, should there be a cap on the maximum amount of prizemoney to avoid PED abuse? I would like to see more investment in the fight against PED use. Prize money is a small factor of financial gain. Sponsorship deals and other financial assistance, in the long term, is far more valuable then prize money. It is a question of managing the investment into the events, predicated on the future of the sport. There is a clear way to control PED abuse in the sport, but the investment is not seen as being important enough. It is a short term view on the matter, unfortunately. Would you argue that the sport has grown so much that it warrants more and appropriate governance from an institutional body such as the IAAF, via its two arms, the IAU and ITRA? It depends on what the end goals are for the sport, as a whole. What does trail running eventually want to become? Trail running was developed from a very pure place, with minimal governance and structure. I think the sport should be accessible to everyone and an opportunity for everyone to experience. If governing the sport takes this away, I think, it could be a bad thing. However commercially maybe governance will assist in growing the sport in a manageable way and allow more people to access it. It is hard to see what the future will hold, but I do believe it will be bright and benefit everyone. Who do you look up in the trail world? I look up to other athletes who achieve their goals in the true spirit of the sport. By this I mean: being ‘clean', giving back to others by being helpful and honest, and also giving back to the sport and organisations when possible. Some ‘elite’ athletes can have terrible attitudes and believe they are ‘above’ others due to their ability to run faster, this is so wrong. We are all humans and should be happy to share the experience and trails together. People who demonstrate respect, not matter how fast they run, are the people I look up to most. You have been a fan of the Asia Trail Master series from early on. What attracted you and how do you see the development so far in our second season? The events that make up the Asia Trail Master Series, are very diverse and located in some amazing places, with incredible scenery and hospitality. I am drawn to the less explored regions, which host some races in the series. I believe some of these locations and events have a bright future, due to the experiences they can provide. Trail running, to me is an adventure to explore my own abilities and new areas of the globe. Experiencing new and different cultures, seeing new landscapes and meeting new friends, are guaranteed aspects of participating in events in the Asia Trail Master Series. It is great to see the series grow strongly in its second year, it is a true indication, of a quality organisation and associated events. You have visited the race venues of MesaStila Peaks Challenge and Ijen Trailrunning recently in Indonesia. From your professional background, how was the experience and why should runners and media flock to Central and East Java for these events? Central and East Java, are incredibly scenic places. The range or terrain and geological features is amazing. To see the locations of MesaStila and Ijen was a great experience. It is not only the locations of the event that are great, but the race organisations are also very friendly and helpful. The people of Indonesia are very honest and great hosts. The accessibility to the event locations, with the help of the organisations, was very easy and an enjoyable journey. I look forward to returning to these events, one day, to experience the trails and the hospitality again. In conjunction with the event, there are a number of other activities and side trips to be done. I recommend exploring the area after the events, there is a lot to see! You have just become the official coach of the Asia Trail Master series. Can you explain briefly what runners can expect from you when they contact you for assistance in their training or nutrition. I provide a service that will guide and educate runners, increase their level of running ability, enjoyment and confidence. I work with people to establishing their personal goals and then set out to achieve them, in a tailored way. Coaching is a very personal form of learning and development. I work closely with my athletes to help understand them as a person, what makes up their life outside of running and how we can maximise development and enjoyment through specific training, tailored to their needs and experience level. To me it is important to cover all aspects a persons lifestyle, including nutrition, sleep, recovery and complementary activities to assist an athletes running. Taking these factors into account, can increase the ability and belief to achieve goals! When it comes to a specific event, it is about looking at all the contributing factors, that are important to success. These are all touch upon in a personalised training program. All runners can expect a friendly response and commitment to assisting them towards their chosen goals. What sort of training do you do to become a competitive trail runner? Let's say you are preparing for the MesaStila Peaks Challenge in October. The key is consistency. You must be able to train consistently and recover optimally, in order to improve and become stronger, faster and more competitive. Training consistently is managed by including a range of different session into a weekly plan. Depending on the phase of training you are currently in, session can include, Speed Sessions, Tempo Runs, Progression Runs, Easy Runs, Recovery Days and Strength & Stability work. Training specifically and recovering optimally, at a consistent rate, will provide great progress as a runner. Looking at a target event, such as MesaStila and identifying the course specific, terrain and conditions, will also help shape your training. If the course is hilly/ mountainous, including specific hill sessions to grow muscle strength and climbing ability, is very important. Similar to this, if the event will be in very hot conditions, it is important to prepare for this. Matching your training to your chosen event and what it will demand from you on the day of the race, is very important. Nutrition-wise, what can trail runners do to prevent injury or stomach sickness during the race? It is really important to Practice, Practice, Practice! Taking notes of what works best for you! Practice with a range of different fuelling options on your easier and long runs. Try anything from Homemade Rice Balls, Energy Gels, Fruit (dates, bananas), sushi or a burrito! This is very specific to the individual (you) and what works for other may not work for you. So trial and error, during your own experimentation is best. Having the right hydration and electrolytes, is also an important aspect, again it is very personal, sweat loss and sodium loss can be tested, so you use the figures, to aid your needs on the run. Running at different intensities will have a large effect on your ability to digest and absorb your chosen nutrition. If your stomach is not working at a high intensity, you can back off your effort and allow your heart rate to lower, until your stomach returns to a state of comfort and functionality. You can train your stomach, just like your legs and lungs, to better cope with the stress of race day. Are we seeing you as a runner in one of our races soon? The list of events on the ATMS calendar looks fantastic. The issue is, which one to choose. I look forward to planning next season and possibly include a few of the events, where and when its possible. I may need to set a side some time to prepare in the location and really enjoy the country and trails! They look that good. Good luck with all your races this summer! Thank you Kris, very much appreciated! Trail running in Vietnam. When you say it, it sounds like the most logical thing. Yet little is known about trail races in the geographically very diverse Southeast Asian country, with the sole exception of the Vietnam Mountain Marathon in Sapa, organised by Topas, a Danish-owned travel company. It is an event - part of our Asia Trail Master series - that has seen its international attendance grow year after year. Still, contrary to other places where trail running has boomed in the last few years, think of Indonesia or China, no other Vietnamese events have made it into people's consciousness. We thought it a good idea to try and learn more about the running scene in Vietnam, and spoke with Nguyen Tien Dat. A keen runner himself and reporter for the online sports magazine Web Thethao. And yes, he has even finished theVietnam Mountain Marathon already, too! Where are you from in Vietnam exactly? I was born in Ha Tay (in the vicinity of Hanoi, the capital of Vietnam). Where I live, there are lots of beautiful landscapes, and many ancient temples with historical and cultural values. One of the most attractive spot is Perfume pagoda with splendid scenery of mountains, caves, and winding rivers all along. Is running an important sport in your country? what is the biggest sport in Vietnam? Currently in Vietnam, running is not the most important sport receiving lots of attention. The favorite sport in Vietnam right now is soccer (football). However, the running trend has started to develop in a more organized way and in multiple running communities in Vietnam. Nearly 3 years ago, I thought I only needed to run 2 to 3 km every morning to stay healthy and I never imagined participating in international races. I met up with others who share my running hobby via social networks, as I was influenced by their running spirit. And gradually, I trained for longer distances of 10, 15, 25, then 30km leading to the first road marathon in my life, and then the Vietnam Mountain Marathon (VMM) a month later. Up to now, running is my joy in life. A week without running and/or cross training, I would feel empty, like missing something. Are you member of a running club? I am a member of Long Distance Runners (LDR), which got established more than 2 years ago. Group members come from all over Vietnam, including expats working here and overseas Vietnamese. We organize regular runs together on Sundays. Close to races like VMM, we have more frequent trail running activities in the vicinity of Hanoi. Currently I don’t have any idol. Before, like other kids, I used to worship one soccer player - Eric Cantona. But then, no more. I like and admire the extraordinary talents of many international athletes, but don’t idolize them. What does your training plan look like? Do you have a coach? I don’t have any personal trainer, I train on my own or with other members in the group. Regarding training plan for running, I usually have a long run on the weekends. On working days, I do shorter runs and other cross training/core workout. I do pay attention to nutrition prior to the race. I usually just eat regular food. Nothing special, I would bring some energy gel packs but i’m not used to it. Do you also run road marathons? If yes, what is your personal best time? I ran the Da Nang International Marathon. My official time was 4 hours 21 minutes. My next goal is to run a personal best under 4 hours at the Halong Heritage Marathon taking place in Ha Long Bay in November 2016 [more info and registration for this road marathon can be done via us here]. Vietnam's geography seems perfect for all kinds of trail running races, yet the Vietnam Mountain Marathon seems like the only one. Do you know of other races? VMM used to be the largest trail running race in Vietnam. However, this year, there are 2 new trail running races: Vietnam Victory Challenge in Da Lat (March 2016) with the longest distance of 50km, and Ultra Trail Nam Cat Tien in the national park Nam Cat Tien (May 2016), with the longest distance of 60km. Even though the trail running community hasn’t really grown drastically, it has shown some promising signs. New trail running races create more playgrounds for trail runners in Vietnam. Besides, there are some small grassroots races organized by different groups and clubs. What do you like so much about the Vietnam Mountain Marathon? Will you take part this year again? It is hard to describe what I like about VMM. I like the cool air there in Sapa, I like the changing scenery of all 4 seasons within a day, I like the simple ethnic minority people - innocent and friendly when we ran through their villages, I like small trails along the mountains covered in the ocean of clouds, i like the golden rice fields in the harvest time, I like the smell of mud after the rain, I like the stone walls spotted with wild flowers along the way, I like the challenging Silver Stone hill standing against the finish line to provoke runners. All my descriptions here, though, can’t fully illustrate what it feels like in reality. You can only experience VMM in the Hoang Lien Son mountain range. I will run VMM this year. A bit more challenging each year. I want to complete the first 100km in Vietnam after 2 consecutive years 42km (2014) and 70km (2015). This will be a great challenge with high risk for me as i don’t have any experience of trail running in such long distance, even though i have tried close to 90 km road running during the 12h challenge organized by LDR. Have you taken part in trail races outside of Vietnam already? Which ones? Unfortunately, I haven’t joined any trail race outside of Vietnam yet. I hope for next year to participate in marathon, ultra marathon, trails in other countries in the region - Thailand, Cambodia, Hong Kong or Singapore. What was your best and your worst experience as a trail runner? One of my most memorable moments is from last year VMM. At the last 7km, facing the Silver Stone, which is the last and hardest obstacle of the 70km race. It was already dark by then, and I kept dragging each heavy step trying to reach the top. Luckily, I didn’t get lost that day, suffered from cramps, or had to deal with any insects or reptiles. What is your dream as a trail runner? Like for many other trail runners, UTMB has always kept its magic and irresistable attraction. What do you think about the Asia Trail Master series? ATM series will motivate trail runners, adventurers seeking challenges and milestones to accomplish. Complete 6 ATMs long distance races and obtain the title of Asia Trail Grandmaster is a great honour for any trail runner! In Cambodia we have seen several significant running events being developed in the past few years. Do you think Vietnam can follow this trend? Most definitely! As I mentioned above, the running community in Vietnam is growing. Many running clubs are being formed throughout the country. Many road marathons and ultra trails have already been organized, even though not yet reaching the scale of other countries in the region. It's still small, but the numbers of participants have increased. I am among the core team of the LDR and have been following the sport community regularly so i can witness these positive movements. What is the biggest brand in Vietnamese trail running today? The largest commercial brand for trail running in Vietnam is currently Salomon. They are the first and only sport brand with an official distribution in Vietnam. Hopefully, in the near future, other famous brands will try out the Vietnamese market. Would you like trail running to become an olympic sport in the future? Why not? Recently, I had a chance to follow and write up about triathlon in the Ironman 70.3 in Da Nang, Vietnam. Triathlon is an official Olympic sport. Challenges during trail running are not any less tough or gruelling, and just as emotional as for those triathletes. Trail running deserves to be recognized as an Olympic sport in the future. I hardly listen to music while running. Actually, while running on the street, I want to listen to the sound of traffic and the sound of life. While trail running, sound of the woods, of birds singing, the sound of water running, and the shifting sound of the trail are way more attractive to me than any music. To me, those are best music. Good luck in your forthcoming races, Nguyen Tien Dat! This weekend the Asia Trail Master series goes to the Philippines for the first points race of the 2016 season. The Cordillera Mountain Ultra in Dalupirit, one hour from Baguio City, is a 50km mountain run featuring Mount Ugo. The Cordillera is an area with loads of sporting and hiking activity. One man who is omnipresent, either as an athlete or as an event organiser, is 42-year-old outdoor specialist Thumbie Remigio. Often, Thumbie is nicknamed the King of the Forest in his neighbourhood. The former mountaineer quite simply loves the trails and when competing in triathlon or duathlon races he needs to force himself to forget his natural dislike for asphalt. Or to dream of his next Xterra event. Thumbie Remigio has achieved a great pedigree in trail running, so let's see what he has to say in advance of this weekend's race. TR: I don’t really listen to music when I’m running. Running in the mountains heightens my senses and I want to hear all the natural sounds of the environment as much as possible. But if I really have to, I prefer the music of the “Ramones”, Red Hot Chili Pepper”, “Cold Play”, “U2” and “Maroon 5”. Q: Where are you from in Philippines exactly? Is running your favourite sport, or do you prefer the MTB? I prefer both although I’ve been spending a lot of times running lately, but every time I finish a big trail race, I do cycling as my recovery exercise. You are also part of an event organisation team called Adrenaline Multisport. Could you tell us a bit more about your company? We are a race organizing company that specializes on off road running, cycling, adventure races and multi-sport races, we’ve been into it since 1999. I have a few, yes: Scott Jurek and Kilian Jornet in running, John Howard and Ian Adamson in adventure racing, Peter Sagan and Fabian Cancellara in cycling, and Manolito Divina as my local running hero. What is so special about the outdoors for you? What draws me into the outdoors is the sense of freedom, and the quietness and beauty of nature. Running or mountainbiking takes me away from the noise and the stress of living in the city. I’m an old school guy, I don’t really follow a structured training regimen, and my training depends on what I feel and think that I should do on a particular day. This style doesn’t cause me too much pressure and makes me enjoy what I’m doing. Usually, my day consists of a run and a bike ride (road or trail) in the morning and strength and conditioning in the afternoon then I try to squeeze in playing Ultimate Frisbee and sport climbing at least twice a week. My Saturday is for long runs and my Sunday is for long rides. I don’t have a coach but I look at the internet for training plans, programs, tips and nutrition. I usually take a lot of fluids a week before a long race, I also do my carbo loading a week prior to the race and i also take protein supplement for my recovery before and after a race. During a race I prefer to bring my wife’s specially made banana bread, bacon and lots of energy gels. Have you run and road marathons? If yes, what is your personal best time? These days there are so many trail running events in the Philippines, also in the Cordillera. What is special about CMU? What’s so special about the CMU is the beauty and vastness of the place; you get to see the other side of Mt. Ugo, which is not frequently used by hikers and runners. The race will bring out the best in every runner as the course is very challenging and is properly and well organized by the Cordillera Conservation Trust. Have you taken part in trail races outside of Philippines already? Which ones? I’ve been to the Mt. Fuji race, Vibram HK 100 in Hong Kong, Mild 7 outdoor quest in China, Sabah adventure Challenge in Malaysia, River Kwai race in Thailand, Action Asia races in HK, Thailand and Macau, AXN races in Malaysia, HK and Singapore ,and so on..
To be able to run and see more of the Philippine mountains and trails, and run beautiful trail races around the world. Help improve the lives of people living in the mountain through trail running and hope that someday, trail running in the Philippines will get more support from the government in the same way as with road running. ATM is now hugely popular among trail runners in Asia and around the world. It’s a very good way of promoting trail and mountain running across Asia and it increases the competitiveness of runners in the region. It also showcases beautiful trail races in Asia that draws the attention of runners from other regions of the world. Manolito Divina, your compatriot, has just run an astonishingly quick 100 miles in Malaysia and is leading the 2016 ATM championship ranking. Do you see any runners who can or have beaten him in the Philippines? Right now, Manolito is at the peak of his running career and with his discipline, focus, experience and good attitude, I can’t see any local runner beating him for the next 3 or 4 more years. This year in the ATMs, we have races on Luzon and also on Mindanao. Is there a difference between the two regions? In Mindanao Mountains, you usually run on volcanoes (active and dormant), in jungle and dense forest. In Luzon, specifically in the Cordillera, you usually run on mossy and pine forest and grasslands. Most of the Philippines' high peaks are in Mindanao and Northern Luzon, the challenge and the experience for the runners depends on how the organizers will present the race and the organizers capability in managing and conducting a good race. How is trail running regarded in your country's society? Before, it was treated as a dangerous, dirty and expensive activity but thanks to social media,trail running is getting a huge boost and becoming hugely popular among regular road runners, multi-sport athletes and adventure seekers. Also the proliferation of races everywhere helped a lot in raising the awareness and interest in the sport. Why do you think Filippino people love sports so much? I think it’s natural to us because of our environment; we are surrounded by the sea and the mountains and our natural instinct dictates that we explore them by swimming, running and riding through them. Why not? With Manolito’s success in the Asia Trail Masters, he has shown that Filipinos can compete at a higher level in the international trail running arena. Maybe we can get our 1st Olympic gold in trail running. This weekend the first points scoring race in Indonesia is on the agenda with Ijen Trailrunning in Bondowoso, East Java. A "run to the blue fire" as the 70k main race is often called as well. The amazing Ijen volcano crater is indeed the centre of the event, which contrary to several other big races in Indonesia keeps its elevation gain -approx 2450hm - within boundaries, which means plenty of local and international athletes see a chance for glory this weekend. One of them is certainly Ina Budiyarni in the women's competition. The number four of last year's Asia Trail Master championship has been endorsed by the RaidLight brand for this year, and is more motivated than ever to leave her mark. 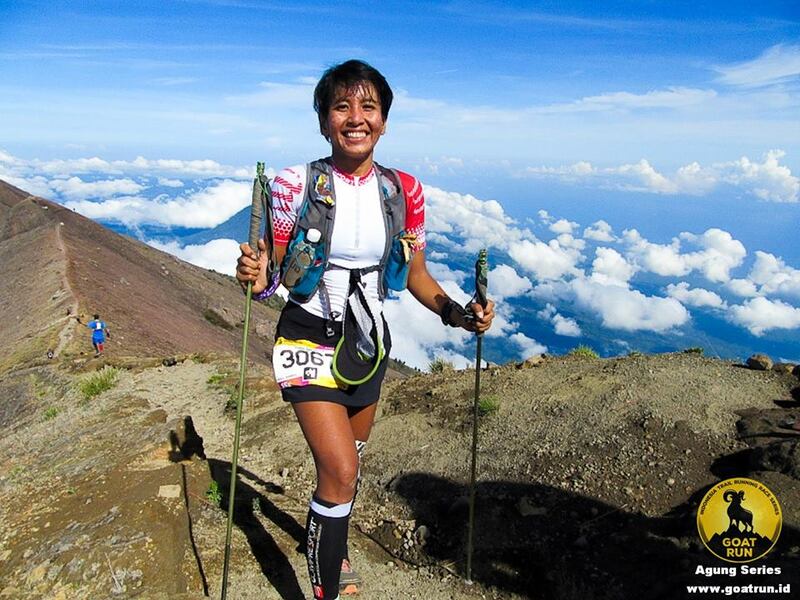 Ina has emerged as one of the most influential people in her country's trail running community. Not only because of her great race results, but also because of her insatiable thirst for long distance running and her stylish appearance. Some say Ina Budiyarni brings glamour to the trail running world. And all this as a single mum. High time to talk trail running with Ina Budiyarni. Q: First, you are often called "The Queen of Trail Running" in Indonesia. We can see why, but how did this happen? IB: Hahaha, I still don’t know why lots of my friends call me ‘The Queen of Trail Running in Indonesia’. And also maybe because of the power of social media, I always post on social media about my trail running journey. I also like to give inspiration to Indonesian women to do trail running like I do. Have you always been a runner, or is it a recent passion of yours? Did you do other sports before? I started running three years ago. First, just a 5k, 10k, 21k, 42k runner, and from there I continued to become a trail runner and an ultra runner. It is a recent passion of mine, especially the trail running and the ultra distances. I was a basketball player and in-line skater before. I got some good achievements like best player and top scorer as a basketball player. Are you a born and raised Jakartian? You are working as a lawyer in the capital, how do you combine your job with all the running and motherhood? I try to balance all my activities, as a corporate legal, a runner and a single mother. That’s not easy and it does not always go well, but I enjoy all my activities and my busy days. On the weekdays, I go for training after office hours. On the weekends, I spend time with my son after my running activities in the early morning. And I still go to the shopping mall also, to hang out with my friends and spent time with my Mother when there is no race on the weekend. As you are attracting a lot of attention in your country, do you actively encourage other women to take up running? Yes, I do encourage other women to take up running with my own way. I started with my close friends, family and colleagues. For Indonesian women out there, they can see my activities on social media, so they can get inspiration to start running and be more beautiful because running makes you always look fit and fresh. Indonesia is a democratic country. Women from all religions in Indonesia can do any kind of sports they want. Soon the annual ramadan begins, as a muslim, what does that imply for your training? Like Ramadhan before, It will change my training schedule for one month. I cannot go training in the morning, I will do my training after fasting and until midnight time on the weekends. You are among those runners who seem to have no problem to run 100km every weekend. What is your secret? Do you seek the runner's "high", or is endurance running for you a form of therapy, a way to relax your mind. How do stay motivated to do all this running? Yes, sometimes I do it for therapy and to relax my mind. I was running ultra distances for therapy to release the sadness - I felt like half of my soul had gone - when my father passed away in December last year. But normally, I go trail running on the weekends to relax my mind from the office things. I stay motivated to do it all, maybe because running has become my passion now. I feel like something is missing if I don’t go out to run for some days. You have a young son, he must be quite excited his mom is often named "the Queen of Trail Running" in Indonesia. Does he like running as well? Yes, he likes running as well. Like mother, like son. He prefers the trail more than the road. He has scored podium finishes in some kids dash trail running races already. What was your first ever race and what did you learn from it? Trail running in Indonesia is still very young, with Hendra Wiyaja as a driving force behind the development of the sport. How have you experienced this evolution? I am very excited about this evolution. Hendra Wijaya gives a lot of inspiration with his experiences in trail running inside and outside Indonesia. He has developed trail running in Indonesia, and made the sport grow every year, and always introduced people to the beautiful trails in Indonesia. Hendra 's races are very tough. Some say, they are too hard. Do you have the feeling that organisers exaggerate sometimes with elevation gain and race distance? Yes, sometimes I have the feeling like that. But as we know, Hendra is an extraordinary person. As a pioneer in Indonesia, maybe he wants to make a difference between his races and other organizers’ races and truly challenge his participants. And he is always concerned about providing plenty of UTMB points in his races. On the other hand there is the Tahura Trail in Bandung, a very popular race in January, limited to 42km and only moderate elevation gain. Proof that trail running does not need to be extreme to be accepted? Yes, it does not always have to be extreme to be accepted. For most people, they will choose the races that they will enjoy. Running medium-length distances and have enough time to finish the trail running race as well. Do you feel there is a need for more official governance of the sport of trail running, or would you keep it all loosely organised as it is now, with most organisers setting their own standards? Maybe we need more official governance of the sport of trail running in Asia. We can use the strict guidelines from ITRA as an international association, but in Asia we have a different situation with two seasons, one wet and one dry. Maybe we need some guidelines to improve safety at races specifically for these two climatic conditions. Almost all trail events are open to the general public, but often inexperienced participants are confronted with risky, technical or even dangerous situations they may not have been aware of when signing up for a race. How do you see that from a lawyer's point of view? At some races in Indonesia, sometimes the participants may not be aware of the extreme conditions when signing up for a trail running race. They want to challenge themselvesbut they should know their own capabilities. The organisers have to make the rules, regulations and requirements very tight to prevent inexperienced participants from doing ultras with high elevation numbers. Such as, when we sign up for a race, especially for an ultra trail running race, the participants need to submit their results of previous races to meet the entry requirements. That’s the first step to screening potential participants, then mandatory gears check should be imposed before race day and again before the start of the race. Participants with incomplete mandatory gear cannot go to the starting line. The organiser have to stick to the rules that they set before. My favourite race is Bromo Tengger Semeru, because BTS 2013 was my first ultra run and my first ultra trail run. Lots of story and memories from my first ultra there! I love the track, love the view along the route, and always want to come back. Have you ever felt scared during a race, e.g at nighttime? Yes, sometimes I feel scared alone at night time in the middle of a forest and I am worried about wild animals. Asia Trail Master series is a challenging trail running series in Asia. We can compete with other trail runners from other countries by collecting points. We can get to know each other and familiarise ourselves with other trail runners around Asia. Asia Trail Master series also give lots of options for doing trail races around Asia. Asia is a beautiful and unique continent. I hope for the best and more success for Asia Trail Master series this year and upcoming years ahead. This year you have become an official ambassador for the popular trail running gear brand RaidLight, together with Arief Wismoyono. How do you like the RaidLight stuff? Yes, I feel honored become RaidLight ambassador this year. I really like and love RaidLight stuff. The outfits are very comfortable, quick drying, light, fit and fashionable on the trails. Indeed, a Very high recommended brand for trail running. How do you select races outside of Indonesia? I am looking for races with points. Points for ATM and points for UTMB/UTMF. Last year you ended in 4th place in the women's Asia Trail Master ranking. Do you hope to score top 3 this year? Some competitors this year have already shown good performances in some races. I am not an athlete, I still have to balance my life between running, working and raising my son as a single mother. There is always the hope to score top 3 this year , I will do my best this year and let God do the rest. Is there someone you look up to in the running community? Not someone, but ALL strong women in the running community, especially the single mothers. What does your 2016 race plan look like? What is your main target? I plan to do all the Asia Trail Master series in Indonesia and probably also looking for Asia Trail Master series outside of Indonesia after UTMF. My main target in 2016 is to become a UTMF finisher in September as I registered as a participant. Thank you very much, Ina, good luck and keep enjoying the trails! Last weekend Ultra Tu Wenchuan was organised in China's Southwest province of Sichuan. Runners loved the astonishingly beautiful scenery along the 50 km course, but also reported on how tough it was. In any case, the race made an impressive debut also thanks to its fine organisation by Mr He Lang and his team. We spoke with him a few days before the race. Race organiser Lang He was firstly a climber rather than a trail runner. He used to devote himself to technical mountain climbing. But once he discovered the beauty of trail running, he realized this is a sport that he will never stop exploring. "Trail running has similar elements as climbing, and I aim to develop trail running with the ideas which are often used in technical climbing," says Lang He. "I want push the boundary of trail running, I want to see people run in places in which people have never run before. I want see there's no boundary between trail running and climbing. Exploring new possibilities shall always be a part of the trail running world." As a trail runner, Lang He accumulated most of his race experience back when he was working in Norway. He has finished TGC in 2013 and UTMB in 2014. This year, his main project is Xreid race in Norway and the Mt. Siguniang Shan race. "They're also ideal races for me: remote, harsh environment, new boundaries for trail running, " says Lang He with a smile. Asia Trail Master: What brought you the idea to establish a trail race in Wenchuan, the place of the disasterous earthquake in 2008? Lang He: Wenchuan is the closest place to Chengdu where we have big mountains. My idea is to run in big mountains, and Wenchuan is a perfect place. It's relatively dry and trail condition is less affected by precipitation compared to the nearby Sichuan Basin. The mountains around Wenchuan city are populated by local villages, and this gives us a lot of trails for running. I have no intention to connect our race with the earthquake, neither Wenchuan government has. We want to show everybody this is a new Wenchuan and it has already moved on from its sad history. Do you think the name Wenchuan will deter some runners from joining the event given what happened? Yes, I think people now may still have a few doubts about coming to Wenchuan, but via events like ours we hope to erase those doubts. We do have a runner who used to serve in the PLA rescue force after the quake. He said he is excited about coming back to the place where he fought so hard for at the time. That is the kind of story we are happy to hear, but we don't want to promote such stories. We want people to come here for our race, not because of a link with the earthquake. UT Wenchuan is an upgraded version of last year's initial event. What has been changed exactly and what extras can runners expect? The length of the course has been extended from 42K to 50K. And an extra 1000 hm has been added to the total elevation gain. Given the fact of the rather rough condition of some trails, we do expect the difficulty of our race to have been significantly increased. Both in TT Plus and Korea 50, experienced runners were complaining that race organisers nowadays all want to have the toughest event without adding anything meaningful or beautiful to the race course. What is your view on this as race organiser? I think as a race organiser you have to think about the nature of your race course. You need to understand why you design a course like you do it. It's not a wise idea to make lots of turnarounds on hills just to achieve a certain longer distance or higher elevation gain. I believe each trail course should have a purpose, like UTMB, it's purpose is to run around Mont Blanc. UT Wenchuan's purpose is to run around Wenchuan City and to see the beauty of this place from different aspects. The race takes place at high altitude, but remains below 3000 hm, which from a medical point of view seems wise for an event open to the general public. Was it a conscious decision not to aim for the highest peaks? We have the possible option to aim for a 4000 m highest point, which is also close to our current race course. But it would be too difficult to design a reasonable course. I don't like to have any turnarounds on my course. I want the shape of my race course to be simple and beautiful. Also, aiming for the highest peaks also brings challenges regarding logistics. What should runners from other countries do and see when they come to Wenchuan? Would you say there is a big difference in the trail running scene in East China compared to Southwest China? Southwest China has a deeply carved landscape. Mountains here are so huge that probably one of those climbs is enough per race. Which finishing time do you expect for the race winner? On the basis of the current start list, who would be your favourite to win the men's and women's races? I expect the male winner to finish a little bit under 8 hours. On the current start list, we have several really strong runners who have won Dalian 100 (Kuo Li), Asics Mountain Marathon (Duanyang Bi) etc. But in my view they may actually not win UT Wenchuan. Given the steep terrain and big climb, local Chengdu runners who are used to run here before probably have a better chance to win. My friend Ruqiao Ren is not a famous runner. He grew up in the mountains and his agility and endurance really impress me. Last year he scored the 2nd place in the Mt. Siguniang Shan race, only behind a Tibetan mountain guide in the highest race in China. If I can bet, I would put my stake on him. Read our race report of Ultra Tu Wenchuan here. Following her superb second place in UTHK last month, jointly with China's Xiao Jing, we felt it was an opportune moment to talk trail running with Tseng Wei Ling from Taiwan. Contrary to Hong Kong, Wei Ling's native island does not yet have too many celebrities on the trail scene. Ironically, she is now also living in Hong Kong, yet very keen to promote the beauty of her home, and assist with the development of the sport, which does face some challenges in Taiwan. Always smiling in race photos, Wei Ling herself just keeps getting better and better in every race she runs. Incredibly dedicated and strong-willed, here's a runner who might just as well go for the Asia Trail Master title by the end of the year! Here's our Q & A with Tseng Wei Ling, and her favourite music to run in the background. Q: Where are you from in Taiwan and what do you do for a living? WL: I am from Taipei city. It has a basin topography. Lots of hills are around my city. And Taiwan, the beautiful hometown I was born is also called Formosa. But today I’m a bank officer and work in Hong Kong. As a child and teenager, I often go hiking or trekking in my home country, Taiwan. There are lots of hills and around 260 mountains go above 3000 meters. On weekends, my parents, friends and I used to drive a car and walk into mountains to enjoy peace and nature. No road running, I was trained to become a trail walker, if you like. My first trail running race was the first edition of The North Face 50 km in Hong Kong in December 2013. When I stood at the finish line after experiencing a sleepless night , strong winds, fog, heavy rain, and a cumulative elevation gain of around 3000 meters, I was not sure it was rain or hot tears in my eyes. I was exhausted but touched. I was able to make it to the finish no matter how tough or how dark it was ahead of me. If I could overcome all unknown and unexpected conditions along the trails, I would become mentally stronger. So afterwards I decided to do more physical training for trail running races. Q: Do you also run road marathons? what is your best time on the marathon? Actually, I haven’t joined any road marathons yet. I was born to love mountains. I have only taken part in trail marathons until now. Maybe one day I will try it but I’m still addicted to trail running. Yes. I know why I am running these days, the desire is my motivation to run and run fast. The feel-good brain chemicals released when I do so may have helped me achieve the speed and distances required. I try to push myself hard, but not too hard. When I find a sweet spot where it is comfortably challenging, I think I feel the so called "runner's high". And, I also feel it when more trail runners are together. I go running for 10 km and do core training during weekdays. And on weekends I tend to go trail running for 30 km to 50 km. I wish to enjoy all training. Although I don't have a personal physical coach, lots of senior trail runners are my mental mentors. They always push me to improve myself. I wish I could finish strong in every trail running race. Be mentally and physically stronger, and then look forward and face the next challenges. It's not easy to combine work and family for lots of trail runners. It is necessary to allocate our times well. Vegan ultra runner Scott Jurek. He always breaks all boundaries and never stops exploring even though he has already scored lots of victories in his running career. And, he is known to stay at finish lines cheering until the last runner crosses. What a touching gesture! Q: How do you feel about trail running in Taiwan. What is special about running in Taiwan? Because I live in Hong Kong, I do not have very much experience in it. Trail running in Taiwan is just beginning. Various types of trails are based on different elevations. You might run cross streams or along the rivers or close to waterfalls, run into the forest and see specific kinds of trees, such as Taiwan red cypress, Taiwan white pine, firs and etc. And you might climb rocks by hands or ropes. I think Taiwan is special as it offers still wild and undeveloped trail types. Q: At present, there is no Taiwanese race on the Asia Trail Master calendar. Which event would you like to see in it? As mentioned above, most trails in Taiwan are quite wild and undeveloped. I would expect a race with a route that covers mountains above 3000 meters. If that, trail runners could see beautiful sunrise with endless sea of clouds and maybe could run with Sambar deers if lucky. But this kind of trail running race above 3000m might not be allowed by the government. I know there is the first edition ofThe Beast Trail race held in June in New Taipei City. The route represents the wild and technical trail type in Greater Taipei. Q: Do you often travel to other countries to take part in trail running events? Q: Last month, there was the news that a big national park in Taiwan (Yangmingshan National Park) has forbidden trail running with immediate effect on environmental and safety grounds, leading to the cancellation of scheduled races. Do you think more parks will follow and forbid races? I hope that won't happen. But how to protect environment during a race and after a race is a very important issue. Trail runners should be taught well. And race organizers and government officials could refer to how Japanese put a lot of effort into ecological planning and protection while holding the big UTMF race. In Hong Kong, I plan to join all ultra trail races. In other countries, I prefer to sign up for popular and classic races. Q: Which Asia Trail Master races are you planning still for this year? Given your high points score, will you try to get a good final ranking? There are lots of interesting Asia Trail Master races, such as Mongolia Sunrise to Sunset and Annapurna 100. I hope I can join them, I need to check with my limited annual leave from work. My favorite part of trail running race is the moment of breaking dawn. It makes me think of being vigorous, fresh and enthusiastic. It makes me keep going ahead. My first 100 miles race was UTMF in Japan in 2015. The trail was muddy because of pouring rain in the previous day and still scattered rain during the race itself. The cut-off time was very tight in the first half of check points. I tried to speed up my pace to pass through lots of technical sections. But after sunset, I couldn't see the narrow route clearly through thick fog in the forest. It's really dangerous because of chances to fall down off the mountain. I slowed down and waited for someone coming with a brighter light. It was my first time to feel helpless. And rain became heavier at night. Trails were muddier and slipperier. In addition, trekking poles were forbidden by organizers for the reason of soil protection . So every trail runner needed to be more careful to go downhill. Lots of runners fell on their butts, faces, knees and other body parts. I got an injury at the lateral collateral ligament of knee joint after going downhill dramatically in the first one-third of the 172 km long race. And my pain still increased in intensity when I approached the finish line. I was in a bad situation at that moment. I was still determined to keep going unless I were to miss cut-off time. So, I really wanted to cry when I crossed the finish line after not sleeping for two nights. I learned lots and gained a lot of experience from this race. I will start training for UTMB-CCC race soon. Although the distance is not my longest race, it's still 6100 meters of positive altitude change in 101 km. No doubt it's very steep up and down, but without any stairs like in Hong Kong. I plan to find similar terrain in Hong Kong and spend weekends running on it. In addition, I plan to spend more time training to hike uphill on a treadmill as steep as it goes at gym, because at CCC I'm actually going to be hiking for almost half of the steep climbs. How to protect the environment and nature is an important issue. There is always a lot of litter on the trail after a race. How to prevent that? Also, the effect of urbanization in Hong Kong is that the government has gradually paved over the ancient trail with concrete in recent years. It looks like an attempt against nature. When we go trail running or hiking, we want to spend quality time on trees and grass, not on city-like sidewalks. I face all challenges and expect to break through them myself. For race organizers, I would suggest that they provide more detailed race information on the websites as early as possible. The most important thing for overseas participants is to run the right way without spending too much time finding routes. I wish all organizers could provide GPS and mark routes more clearly.